Based on the Five Little Monkeys song! 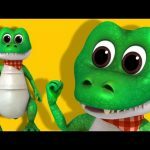 Crocodile Song | Nursery Rhymes | Original Song by LittleBabyBum! ABC Song | Zed Version | Balloon Song | Original Song by LittleBabyBum! A Tisket A Tasket | Nursery Rhymes | By LittleBabyBum! Hey Diddle Diddle | Nursery Rhymes | By LittleBabyBum! Five Little Birds | Nursery Rhymes | Original Song based on “5 Little Ducks” by LittleBabyBum!